Back in 1988, I met my first Rottweiler and it changed my life. In 1990, Wesley and I acquired our first “retired” Champion Rottweiler. Since that time, our dogs continue to be active in many dog organizations that involve conformation, obedience, agility, tracking, herding, carting and we even have a few dogs competing in the sports of Schutzhund and dock diving. Most importantly, our dogs are our family companions as are all of the dogs produced under our Maplemor name. 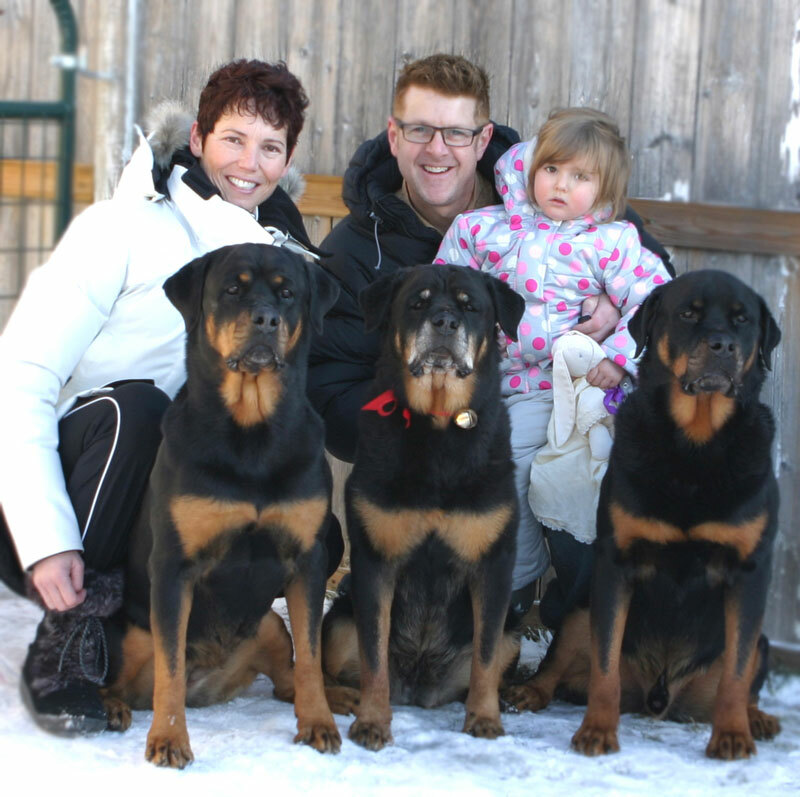 Though we have owned this noble breed for over 20 years, Maplemor Rottweilers was officially “launched” with our first litter back in 2002. The “A” litter put us on the map and with that, allowed our foundation female to “make her mark” in the Rottweiler world. We currently call Calgary, Alberta, Canada our home and we enjoy competing on both sides of the “border”. Many of our puppies have gone on to become Conformation Champions, obtain Best In Shows, Best in Specialty Shows, obtain Tracking Champion Titles, obtain Master Agility Champion Titles, obtain Awards of Merit and obtain High in Trials both in obedience, herding and agility. Maplemor has even gone on to produce AKC Dual and Triple Champions. The dedication of our owners to the Breed Standard speak volumes to the homes our dogs are placed in and the pursuit of maintaining the Workability of the dog. A great amount of emphasis is placed on breeding pedigrees that excel in both conformation, performance, temperament and health. You could say it’s our passion here at Maplemor and we are very grateful to have owners of these pedigrees that believe in the same. We have had the good fortune to also breed and co-own dogs with others that share our same goals and passion. From time to time, we take a break to breed what we feel is the best representation of our breed and our breeding program and thus continue the the Maplemor Tradition of excellence. Come spend some time on our website and take a look at why our small kennel called Maplemor, produces the exceptional quality dogs we do…………. Director of the newly formed CKC Club – Central Alberta Tracking Association (C.A.T.S).